In such an oppressive world, something has to set you apart from the masses or you would never even consider going up against the Shadow and his forces. 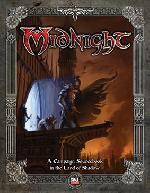 In Midnight, that “something” is a Heroic Path, a piece of your lineage that links you to something powerful or magical. You can be Giantblooded or Charismatic, Quickened or Dragonblooded. Deirik - The eldest son of Yakob who is the Patriarch of the Mjarn clan. Deirik is a Rogue whose Heroic Path is Quickened, which means he can move with supernatural speed, and is therefore faster to react and harder to hit. In the Trader (Traitor) Saga he is charismatic, impetuous, and heroic, wanting to save those people that he can while also ensuring his family at least survives, if not thrives. Still being in his late teens when the saga begins, he tries to balance his responsibilities with his personal desires, with the latter winning out more than it should at times. Eirik - The slightly younger brother of Deirik, he is the more stern and level-headed of the two. Eirik is a Wildlander (Ranger) whose Heroic Path is Ironblooded, which increases his hit points, makes him deflect more damage, and increases his natural healing rate. In the Trader (Traitor) Saga, he is Deirik’s enforcer. Anything his brother says is practically law, only to be questioned in the privacy of their quarters. He cares just as deeply about his family’s survival, but is also privy to being influenced by the heroic dreams and desires of youth. Ygvard - Second Cousin to Deirik and Eirik, he is secretive and quiet with good reason. Ygvard is a Channeler (Magic User) whose Heroic Path is Faithful, which connects him to his spiritual ancestors granting him spell like abilities such as Bless, Turn Undead, and increased Wisdom. In the beginning of the Corruption Saga, Ygvard follows the lead of Deirik and Eirik while using his magical abilities only when he’s sure there are no Legates or astiraxes nearby, or when he must use his healing in dire straights. His desire is to increase his personal power, as the more power he has, the less he has to be concerned about using it. Boldulf - Second Cousin Twice Removed (aka, Deirik’s Grandfather’s brother) to Deirik and Eirik, he’s also Ygvard’s grandfather. While he is in his late 50’s, Boldulf still has a lot of life left in him and provides his advice, or fists, to help his family. Boldulf is a Defender (Monk) whose Heroic Path is Warg, which grants him an animal companion (a wolf named Sergei), shapeshifting abilities, and wild empathy and senses. In the Corruption Saga, Boldulf’s greatest desire is to protect his family, and would follow them to the end just to be with them and keep them as safe as possible. Player Commentary: So, I play Eirik in this campaign. Despite being everyone's "second," I think I've managed to cause or provoke like half of all the trouble we get in to.